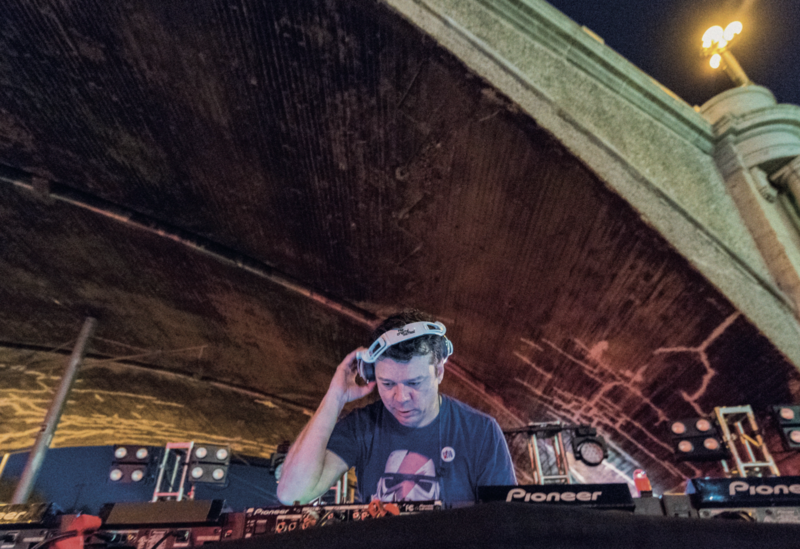 On the north side of downtown Los Angeles, under the Broadway Bridge, a parking lot heaves with the breakbeats of Scott Kirkland of The Crystal Method’s DJ set. A train screeches overhead, wheels clacking and lights flashing, providing the best unintentional visual and aural accompaniment to the tracks Kirkland is playing. This is The Viaduct, a pop-up venue, which if it wasn’t so sanctioned, would be reminiscent of many DTLA spaces once co-opted by the underground ravers of the early ’90s and turned into illegal party venues. Kirkland was among these ravers, and now, staring down the half-century barrel, he is just as animated and enthusiastic as he was 25 years before. Just a few days ago, he was chaperoning his son’s field trip to Catalina Island. Now the headband of his headphones covers his eyes — a signature look for him — as he works the mixer. He shouts out his personal connection with some of the classic dance tracks he’s playing into the microphone, igniting the elusive feeling of excitement from that time, refreshing it for the present, creating living history for those who weren’t even conceived then. Many key individuals formed the underground character of the city in those years. Some of them are still active members of the scene, but more of them have shifted to other paths. Kirkland, and Ken Jordan, his partner in The Crystal Method up until almost two years ago, for all their indulgences and endless nights of going out, always treated what they did as a real profession, looking at the big picture and the long game. “We are not the most talented or the most prolific,” says Kirkland modestly. “We are guys that are taking stuff very seriously. Attitude has a lot to do with sustainability.” “We never thought we were making music this week and going to be doing something else next week,” says Jordan, who is now retired and living in Costa Rica, focused on organic gardening and his and his wife’s non- profit, Green Wave. “This was our career and our passion, that we wanted to do for a long time." While Jordan is able to retire early because of The Crystal Method, Kirkland is able to provide nicely for his family, on par with any degreed and pedigreed professional. 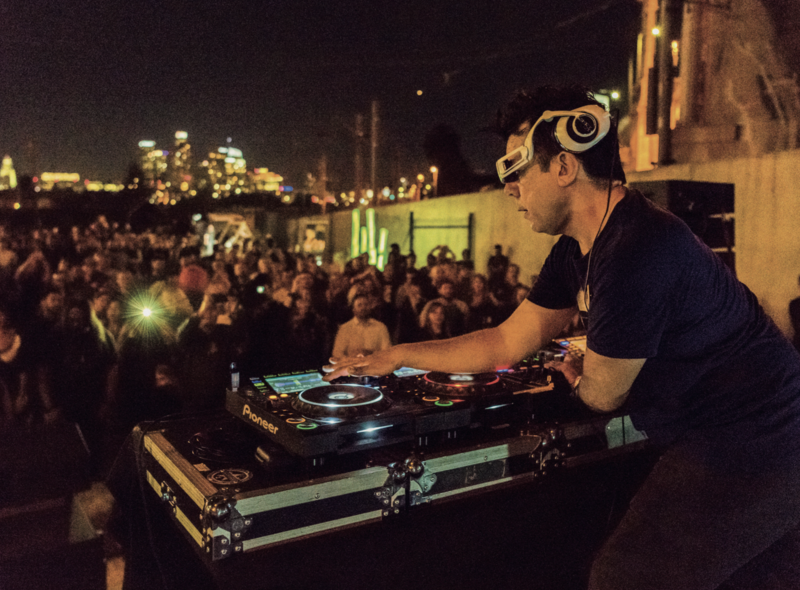 He continues to release quality music, including the recent album, ‘The Trip Home’, on The Crystal Method’s almost 10-year strong Tiny E Records. At the same time, he has written the front and end titles, and some additional themes, for 3 Below, Guillermo del Toro’s animated show on Netflix, and is holding down a heavy calendar of DJing dates. Last year, in between working on ‘The Trip Home’, Kirkland was on tour with Tool as their opening act, and scoring the documentary, Hired Gun. This type of multifaceted activity has been the way for The Crystal Method almost from inception. When their contemporaries were DJing sure-to-be-busted parties on the coasts, these two were on a 150-city bus tour of North America, playing live shows in small towns in the square states. When no one knew how to turn on a sampler, these two clocked in daily at their fully operational studio. When the most you could hope for was another underground DJ to drop your track, these two were getting daytime radio play. When you were overjoyed at selling 500 copies of your 12” internationally, these two’s debut album, ‘Vegas’, went platinum. At the same time as performing at their own shows and raves, they were also appearing at alternative rock radio festivals, occupying the closing slot. In one instance, after Green Day, who had lit all their instruments on fire before leaving the stage to a dumbfounded Kirkland and Jordan, they gamely set up and won the crowd over with their dynamic show. The Crystal Method were the DJs for Versace’s fashion show, and they scored the first season of Fox’s Almost Human, and the soundtrack to the Jessica Biel film, London. They provided the first ever Nike and Apple workout mix, Drive, for the NikePlus system. Their song ‘Keep Hope Alive’ was licensed as the main title theme for NBC’s Third Watch, and they created an original track as the main title theme for Fox’s Bones. “When I’m sitting next to a grandmother on a flight to Chicago and we get into a conversation, and she asks, ‘What do you do?’, I go right to Bones,” Kirkland chuckles. This is not to mention the countless syncs and licenses they’ve had, which as Kirkland says, “Kept the lights on a little longer,” while Jordan remembers their initial reluctance. It’s The Crystal Method’s manager of over 20 years, Richard Bishop of 3AM Management, who is tasked with all the “talking into.” It’s also Bishop who can be credited, at least in large part on the creative management side, for The Crystal Method’s longevity. Although at the start, it was Bishop who had to be talked into considering becoming the duo’s manager. It worked in The Crystal Method’s favour that Bishop was not an electronic music manager. He focused on the duo’s strengths, building a live show which he says was like the electronic version of Kiss, pushing them into the unknown markets, losing money touring but gaining it in record sales, and getting the attention of radio in the process. When films and commercials were looking for contemporary sounds and alternative artists weren’t willing to license their music for misplaced credibility reasons, The Crystal Method was more than able to provide music that was symbolic of the time — once Bishop convinced them it was the right thing to do. And while accomplished producers such as Junkie XL and Photek have entirely turned their focus to film and television, The Crystal Method balance both sides. Kirkland’s professional music life has been entwined with Jordan’s. ‘The Trip Home’ wasn’t entirely Kirkland on his own. Glen Nicholls has a co-producer credit, and Tobias Enhus, who occupies another one of the rooms at Kirkland’s studio, also has a hand in the production. Kirkland had a lot of “producer blind dates” where he was set up with people who he might have gotten along with, but he was in no rush to get together with anyone. "You have to be smart and broad reaching and far-reaching, and nice"
‘The Trip Home’ is subtle and cinematic. It moves like a futuristic soundtrack, each song a vignette, and most of them not aimed at the dancefloor. You’ll find 60bpm to 80bpm numbers on there, including album opener ‘Raze’, and expansive, emotive moments on the aforementioned ‘Chapter One’, as well as instantly identifiable, acid beep-laced breakbeats such as on ‘Holy Arp’ and ‘Ghost In The City’. There are shorter compositions, such as the floating ‘Carry On’, that connect the stories of the songs together. Even within the space of a single song, such as ‘The Drive Inside,’ there is breadth and depth, moving from an introspective mood to a more extroverted one. Kirkland is also planning on releasing the counterpart to ‘The Trip Home’, ‘The Trip Out’ in 2019. Also, next year is the return of The Crystal Method live show, reimagined. All evidence shows that Kirkland has hit the ground running as a one-man operation, and fully recovered from the brain surgery he underwent in 2014, as well as its resultant complications. Want more? Find out what five albums techno selector Nicole Moudaber can't live without.